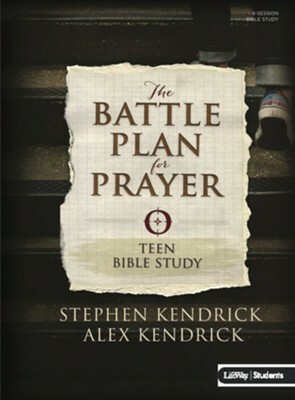 The Battle Plan for Prayer - Teen Bible Study is an eight-session study that will expand students understanding of prayer and spiritual warfare. This resource, written by brothers Alex and Stephen Kendrick, will help students develop the spiritual discipline of prayer, as well as challenge them to develop a personal prayer strategy. Stephen Kendrick is co-writer of the New York Times best sellers, The Resolution for Men and The Love Dare and producer of the movies COURAGEOUS, FACING THE GIANTS, AND FIREPROOF. Stephen is passionate about mens discipleship and has spoken to churches and mens conferences across the nation. He serves on the board of the Fatherhood Commission and has been interviewed by FOX and Friends, CNN, and ABC World News Tonight, among others. Stephen and his wife, Jill, have six children and live in Albany, GA where they continue to serve as active members of Sherwood Church. Alex Kendrick is best known as an actor, writer, and director whose film credits include FACING THE GIANTS, FIREPROOF, AND COURAGEOUS. He is co-writer of the New York Times best sellers, The Resolution for Men and The Love Dare. Alex is passionate about mens discipleship and has spoken to churches and mens conferences across the nation. He has been interviewed by Good Morning America, ABC World News Tonight, CBS Evening News, Fox News, CNN, Glen Beck, Dr. Phil, USA Today, The New York Times, The Washington Post, and Time Magazine. He and his wife, Christina, have six children. He and his wife, Christina, have six children and live in Albany, Georgia where they serve as active members of Sherwood Church. I'm the author/artist and I want to review The Battle Plan for Prayer, Teen Bible Study.